The 1st annual USA Goju-Ryu Seiwa Kai Instructors' Seminar was held at the USA Hombu Dojo in Santa Monica, CA, May 18 - 20, 2012. 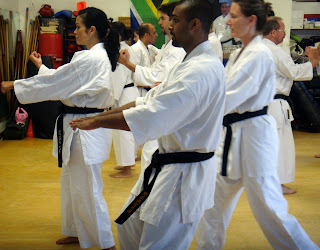 Vassie Naidoo, Shihan (Santa Monica, CA) was the Head Instructor. Desmond Tuck, Shihan (Palo Alto, CA) and James Pounds, Shihan (Austin, TX) were the assistant instructors. Twenty-nine instructors and assistant instructors from the US and Mexico attended. Since the USA Seiwa Kai has recently added new dojos in CA, OH, MI, and NY, it was an opportune time to get everyone together in order to promote quality of instruction. In addition, the new Board of Directors for the USA Goju-Ryu Seiwa Kai was appointed. The Board consists of Vassie Naidoo, President; Desmond Tuck, Vice-President; James Pounds, Secretary; Brian Burdick, Treasurer; and Board Members Johnpaul Williams, Joe Palminteri, Mark Cramer, Dan Taylor, and Kevin Moske. All Board members are Head Instructors. Lesson #1: A cardboard box could be your dojo. Chojun Miyagi was the founder of Goju-Ryu karate. He trained in his garden, although he called it a dojo. Seko Higa, one of Miyagi's first students and one of the three students certified to open a dojo, made his living room and hallway his dojo. The cardboard box statement may have been a bit of an exaggeration, but needless to say, if a garden and a living room were good enough places to train for the earliest teachers of Goju-Ryu, then one needs only sufficient floor space and a willing mind to train. years just learning gekisai dai ichi, but I am aware that in moving forward sooner, I must constantly return to the foundations and work out each move and sequence until everything is fully mastered. modified Sanchin serves little purpose for advanced training without the turn since many of the other katas contain similar turning techniques (Sanseiryu comes to mind as an example). We are fortunate to belong to a dojo that practices Sanchin as it was meant to be practiced so that we receive the full benefits of the kata. A senior student of Miyagi was giving a demonstration in Japan and was asked the name of his style. He was unable to respond since Miyagi had not given it a formal name. The student then returned to Miyagi in Okinawa to ask him, and Miyagi decided to call it Goju-Ryu. Unlike the senior student, we have to know the names and meanings of our style and techniques. Within our dojo, perhaps names are unimportant so long as the techniques are correct and fully understood. 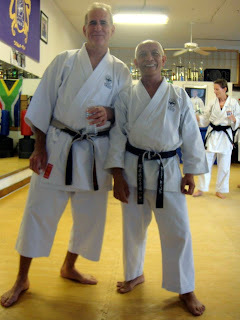 However, outside our dojo, it is our responsibility to know and understand names so that we can explain them to others in order to promote Goju-Ryu karate. development (in other words, physical and spiritual development) rather than the practice of clearly defined self-defense. While Tensho clearly has applications, it was named a kihon kata, which generally place focus on developing breathing and internal energy. Hiding the applications of Tensho may have served to help the general public view Goju-Ryu in less violent light and more of a "health benefits" light, but to the practitioner of Goju-Ryu, both aspects are apparent. 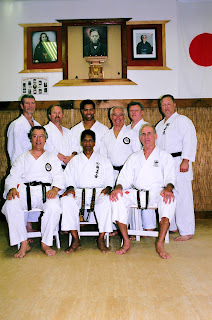 Hopkins, G. \Politics and Karate: Historical Influences on the Practice of Goju-Ryu." Journal of Asian Martial Arts. 16(2007). Porta, J. and McCabe, J. \The Karate of Chojun Miyagi." Journal of Asian Martial Arts. 3(1994). Toguchi, Seikichi. Okinawan Goju-Ryu. Website accessed 11/30/11. 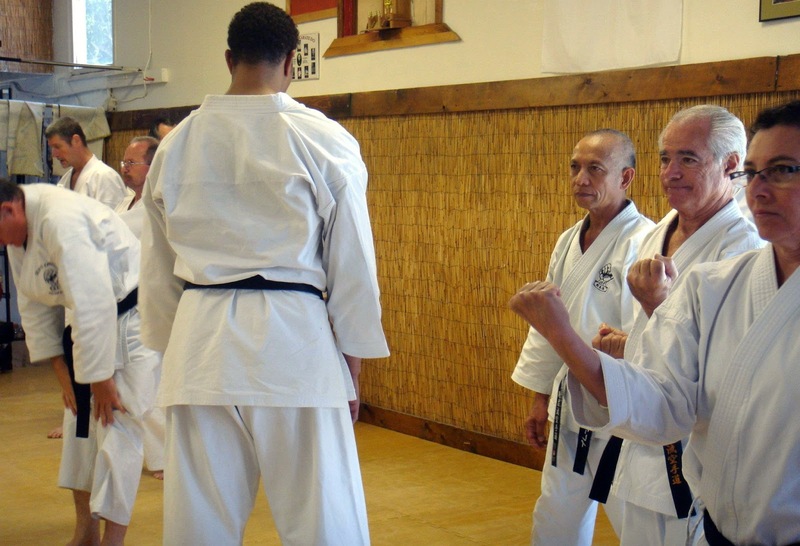 As part of our tradition of physical and mental training in karate-do, we require our students, beginning at brown belt (3rd Kyu) level, to submit a paper on a martial arts topic from their reading. These papers are not meant to be academic papers as much as they are conversational in nature about something personal the student has learned, or further investigated, from what they read. These papers are shared with the dojo so that we all might learn from them.